If you have been following me for any length of time you will know that I am a sheet mask addict! I love sheet masks and see positive results in how my skin looks and feels when I am diligent about masking daily. I usually review 1-2 sheet masks on my Instagram channel on a weekly basis so if you don't already, please follow me here on Insta. Last year around black Friday I decided to splurge and I signed up for a year of Mask Maven, a monthly sheet mask subscription service. Overall, Mask Maven wasn't a bad subscription service but it wasn't the best either. Recently, I have been following Facetory on Instagram and they had a special black Friday discount code to save money off one month's box. I thought why the hell not, just buy one month and just see how it compares to other mask services out in the world. Well, I am so glad I did because I am extremely impressed with the monthly box that showed up in my mailbox. I purchased the December Seven Lux box, this was not sent to me. 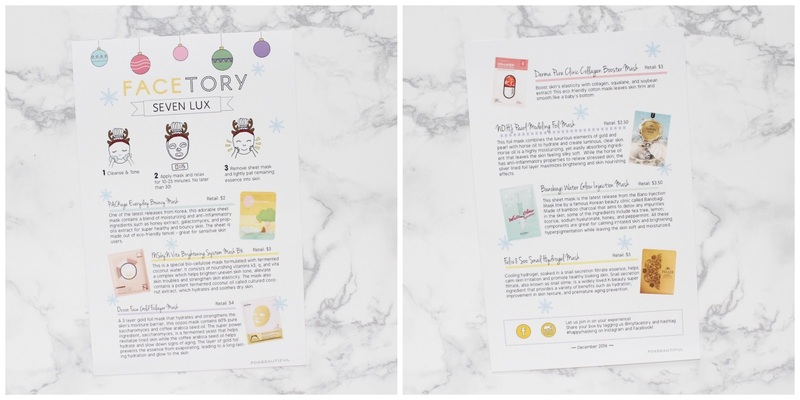 Facetory is a month to month sheet mask subscription service that offers two types of boxes, the Four-ever Fresh and the Seven Lux. The Four-ever Fresh is an entry level mask box for those Korean beauty newbies or those new to sheet masking that includes 4 masks for $4.95 per box plus .99 cent shipping. Since I've been using Asian beauty products for well over 10 years, I decided to go with the other box option called Seven Lux. This box features 7 high functioning, higher quality ingredient masks in a variety of materials (hydrogels, multi-step masks etc) delivered right to your door for $14.95 and shipping is included. As of now they does not offer a bundle subscriptions like 3 months, 6 months or 1 year plans, it is just billed monthly. Isn't this packaging so cute! It arrived in this square box with the sweetest graphics printed on it and inside, the masks were neatly wrapped in red tissue paper and tied together with a bright yellow ribbon. There was an information card included inside the box which explained each mask in detail. I also like how they included the retail price of each mask and the info card has the same cute graphics. I did use a discount code to purchase this box which came to be $11.96. The value of this particular box was $23, so a great value in my opinion. 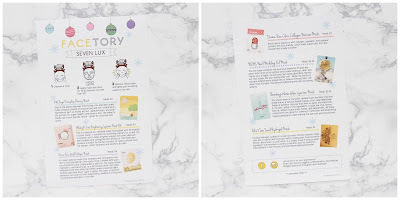 Here are the masks that were inside December's Seven Lux box. Two of the brand I had heard before and five of the masks are from new-to-me brands and all of these masks I have never tried. Win!! 1. Derma Pure Clinic Collagen Boaster Mask - contains collagen, squalane and soybean plus this is made from eco friendly cotton. 2. Banobagi Water Glow Injection Mask - this is a mask line made by the famous Korean beauty clinic called Banobagi. This mask is made of bamboo charcoal and is for detoxing and brightening. Ingredients include tea tree, lemon, licorice, hyaluronate, honey and peppermint. 3. Feliz 8 Soo Snail Hydrogel Mask - This mask is made with snail filtrate essence to help calm skin irritation and promotes healthy skin function. 4.. Oozoo Face Gold Foilayer Mask - This is a 3 layer foil mask that contains 60% pure saccharomyces (fermented yeast) and helps hydrate and strengthen the skin. 5. MSbyN Vita Brightening System Mask BX - This is a bio-cellulose mask formulated with fermented coconut water. This mask also contains vitamins K (rare) that helps soothe, nourish and hydrate dull skin. 6. NO:HJ Pearl Modeling Foil Mask - This is one of my favorite mask brands! This is a foil mask that combines gold, pearl and horse oil to hydrate the skin. This also has anti-inflammatory properties, helps brighten and nourish. 7. PACKage Everyday Bouncy Mask - this is one of the hot brand right now in Korea. This is a mask that contains a blend of moisturizing and anti-inflammatory ingredients like honey, propolis and galactomyces to healthy and bouncy skin. This is also made from an eco friendly material. Overall, I am really impressed with this box! The variety of masks included was superb and the ingredients, mask materials and skin concern solutions were outstanding. I would highly recommend checking out Facetory if you want a mask subscription service that is well worth the money. Have you tried Facetory? Have you used any of these mask before? ?